Five Outrageous Mods That Every Car Owner Should Never Do | OhGizmo! What’s The Most Desired In-Car Tech? Dudes do the darndest things to their cars. There are some who are so obsessed with modding that they constantly work on their cars until they no longer look like cars that can be safely driven on the road with children on board. Others aren’t as extreme, although their vehicles look more like scrap junk instead of cars when they’re done with their custom mods. It’s time to draw the line between a good car mod and a really bad mod, starting with the first one above. 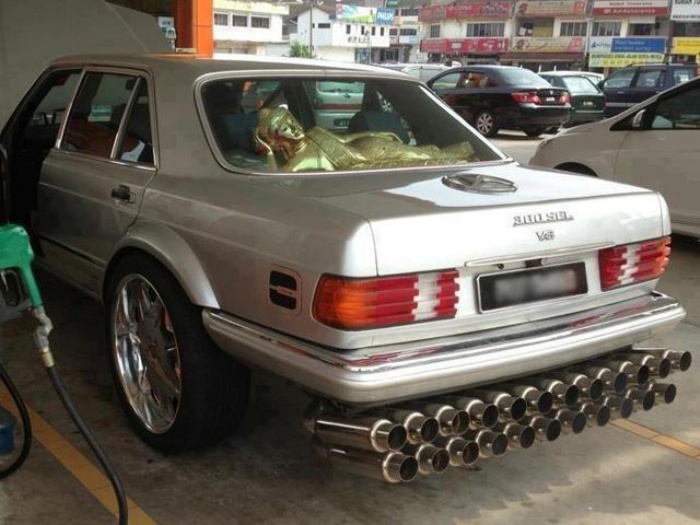 One exhaust is normal, two might look cool, three might still be acceptable, but more than that is just overkill. Remember that these are cars, not rocket ships. That and the fact that it doesn’t really add anything except aesthetically should discourage you from ever modding your car this way. Exhaust pipes aren’t the only things guys go overboard on when it comes to jazzing up their cars. 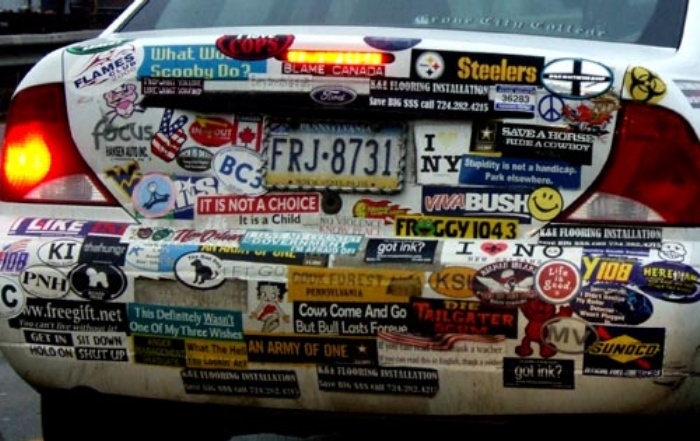 There’s also bumper stickers, window stickers, and decals that make any car’s rear end (and perhaps its front and sides as well) look like crap after a mere few weeks. It always starts with one, but then people will always find another thing to stick on until the car’s color can barely be seen. It looks fine, nice even, for a couple of weeks. Then the dirt and grime settle onto the edges and after a long-enough period, the car owner will eventually see the error of his ways and decide that it’s time for a paint job. Or a really thorough scrubbing. But when it comes to really bad mods, cut-out conversion mods probably take the cake. There’s no other way to call what this guy did. 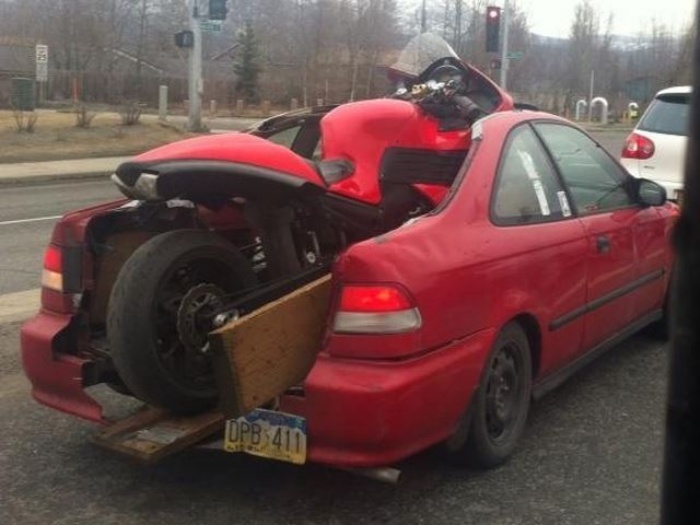 He basically chopped his sedan up to for a motorcycle at the back. He probably should’ve just sold the darned thing and bought a pick-up instead, but no, he wanted to do it the wrong way and took the saw to his car. I had a friend who attempted to do something similar with his Saab. Suffice to say, all he did was mess up his car. It was especially bad since the parts were pretty hard to come by ever since the car maker went belly up. He was lucky enough to find Saab parts being sold online and he hasn’t attempted to mod his car or anything else, for that matter, from that point on. 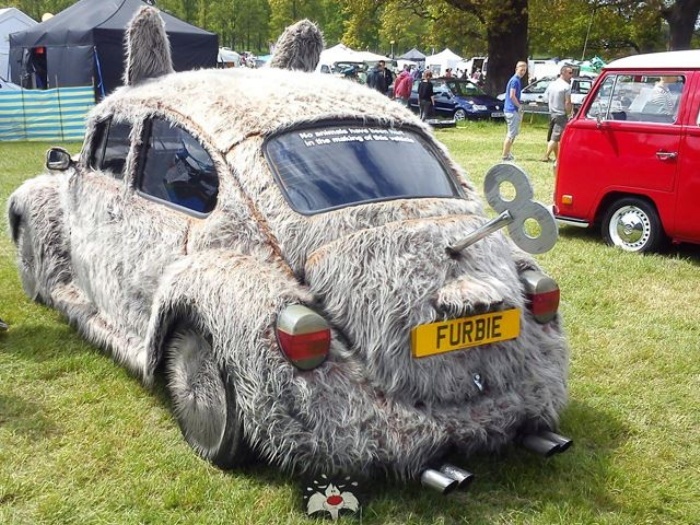 Furbies are normally cute, fluffy, and cuddly, but a Furbified car is none of the above. Please bear that in mind before you decide to buy dozens of mop heads and stick them all over your car. It’ll look sad, dirty, messy, and you’ll have all sorts of problems to deal with when it rains. The ears are a nice touch, but they don’t make the car any less ridiculous or difficult to drive. And it’ll probably make you the laughingstock among your friends. Just remember that once you Furbify a car, there’s no turning back–and despite what your kids or girlfriend or friends say, don’t do it. Just don’t. Last but not least, we’ve got the people who overdo it with lift kits. A little lift is fine, but do remember that a little goes a long way. Too much just makes your car look abnormally bad and it’ll make you, the driver, look especially dumb for ever deciding to do something like that to your car. What other car mods have you seen that also get on your nerves? What about fart pipes and spoilers on Hondas? 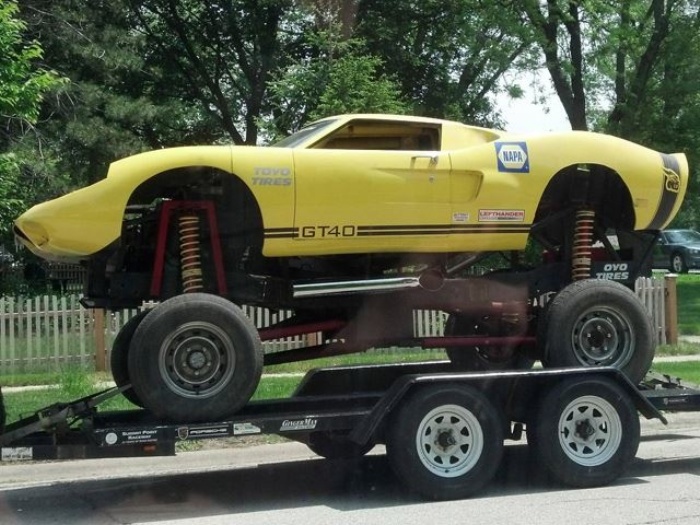 While I completely agree that some lift kits are so extreme they’re ugly; the last vehicle pictured is actually a monster truck with traveling wheels on it. They are kind of hard to move at their full height.